Adidas Presentation Tracksuit embellished with your club badge printed on the jacket only. 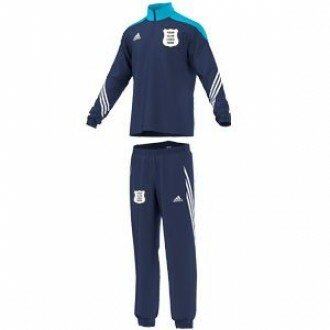 Due to issues with this range of Presentation Tracksuit print is not possible on the Tracksuit trousers. As of 8th June 2016 all Presentation Tracksuits ordered will only have the Jacket printed with the club badge, the Tracksuit trousers will be blank or with initials only if appropriate. Supplied as a size set this stylish microfiber fabric tracksuit is comfortable and lightweight making it perfect for pre & post-match travel.